Okey doke, Around the Interwebs, Part 2. Sarah's hosting a giveaway for Suite Scarlett by Maureen Johnson! Definitely head over there and enter because it's a fabulous book. Liz posted a press release about Class of 2k9 member Albert Borris, author of the upcoming Crash Into Me, who suffered a stroke and is still recovering. The kidlitosphere's great at showing support, so do check out Albert's book. Adrienne pointed me to this great interview with Jan Thomas, author of What Will Fat Cat Sit On? 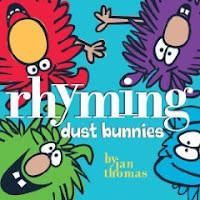 and Rhyming Dust Bunnies (among many other fabulous books). And speaking of authors of my favorite storytime books, check out a sneak peek of Mo Willems's upcoming easy reader, Cat the Cat. And don't forget, Mo has the best dining room ever (I have such house envy). Susan reminds us about the wonderful Mid-Continent Public Library's awesome listing of series and sequels. If you don't know about this site, you seriously need to check it out. It's my first resource to find out what the third Pony Pals book is or print out a list of all the Junie B. Jones books. I can sort of see why Harry Potter trickled down, though I personally refuse to recommend it to anyone younger than sixth grade. At its opening, it's a fun adventure-in-magic-school story. By book three, though, the layers have built so thick and dark that the book beyond its surface is best enjoyed by readers with more life experience. IMNSHO. I still think third-graders are better served by books other than Harry Potter. And that's it for Around the Interwebs this time around. What have YOU been surfing lately? I haven't heard of Jan Thomas before, so I just put one of her PBs on hold so it'll be waiting for us when we get back from vacation. Thanks for the rec!